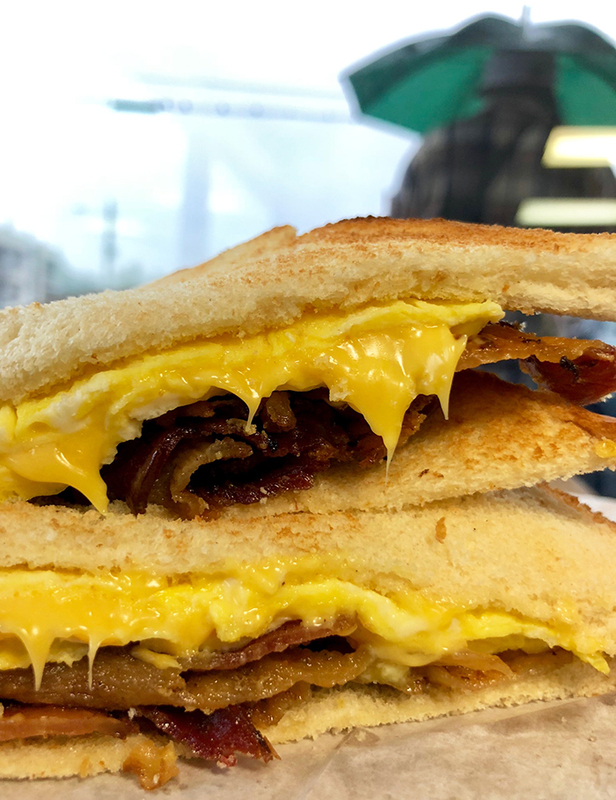 Here’s a list of the 16 best bacon, egg and cheese sandwiches in our city. Much like yourself, I’m not afraid to shy away from a hearty breakfast. I’ve spent the past month devouring our city’s BECs. Below are the top 16, in no particular order. 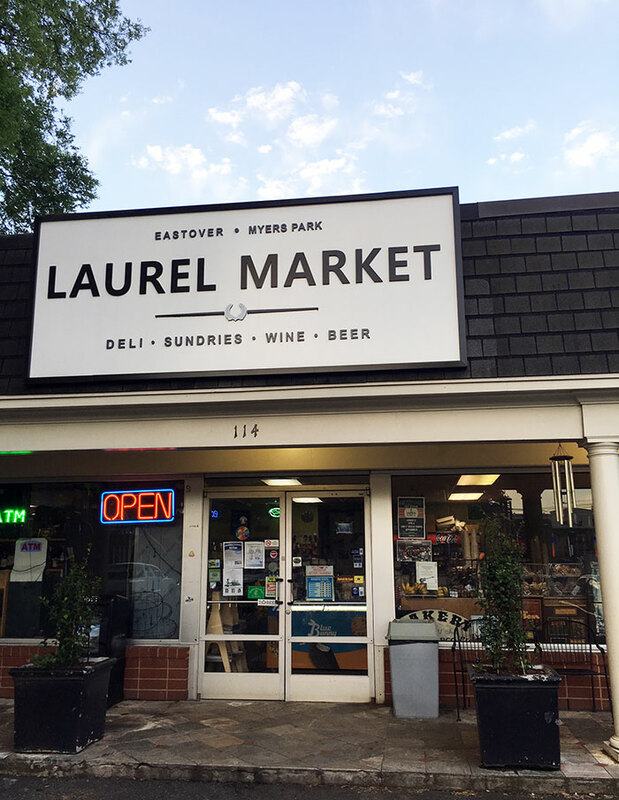 Vibe: Neighborhood market with a killer deli that’s a favorite amongst its Myers Park and Eastover neighbors. 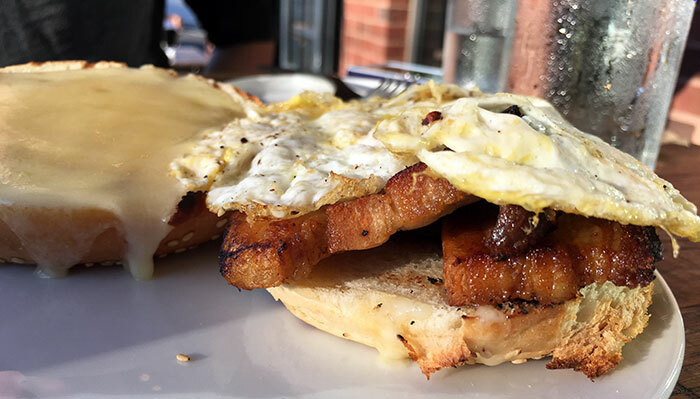 Analysis: Fresh bread, perfectly cooked eggs and melted cheese that complement instead of taking over makes this the #1 BEC in Charlotte. Still room for improvement by adding more bacon. Each morning, Laurel Market lines up 10+ carafes of different coffees. It’s beautiful. I’ll be honest, it could have used some additional bacon- and Laurel Market has the best in Charlotte. 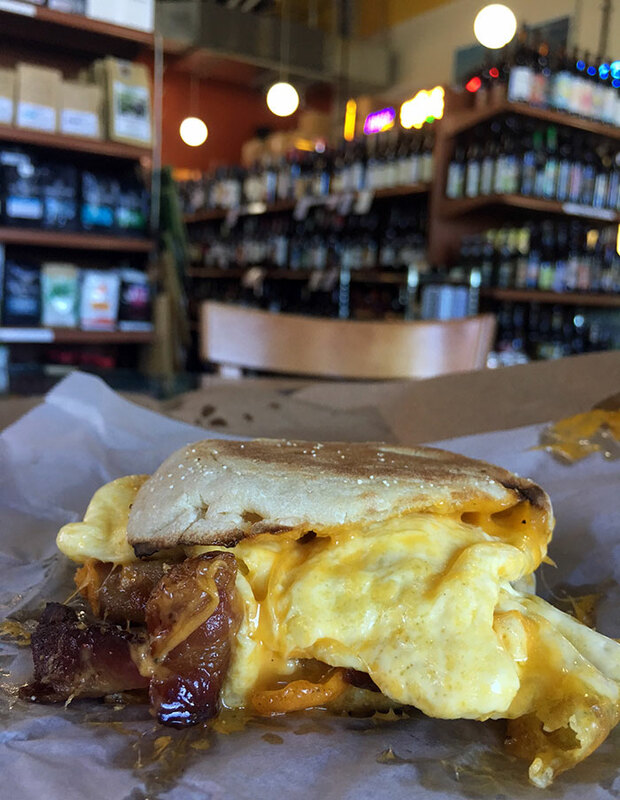 Vibe: No-frills bagel and deli in Cotswold. 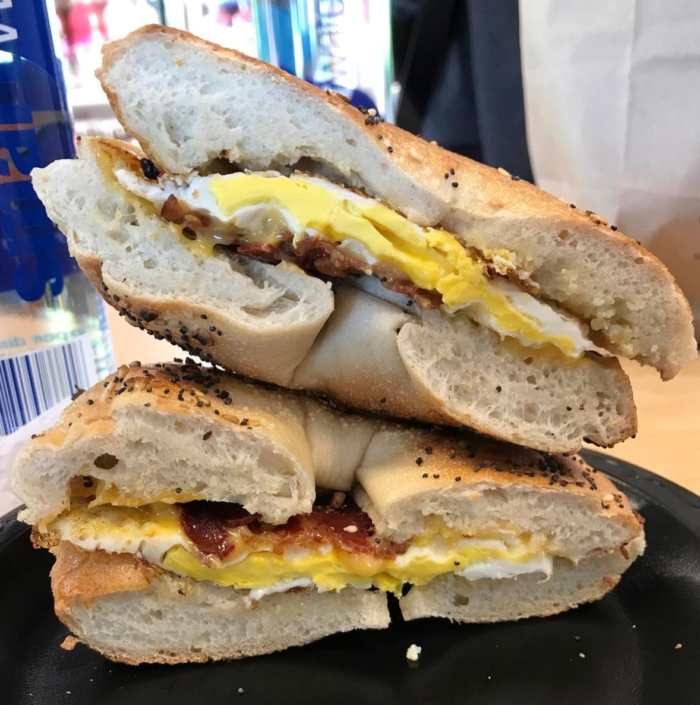 Analysis: Poppy’s is clearly the #1 bagel spot in Charlotte, so anytime you add bacon, egg and cheese you’ve got a winner. The bagel makes the sandwich. #1 bagel spot in Charlotte. 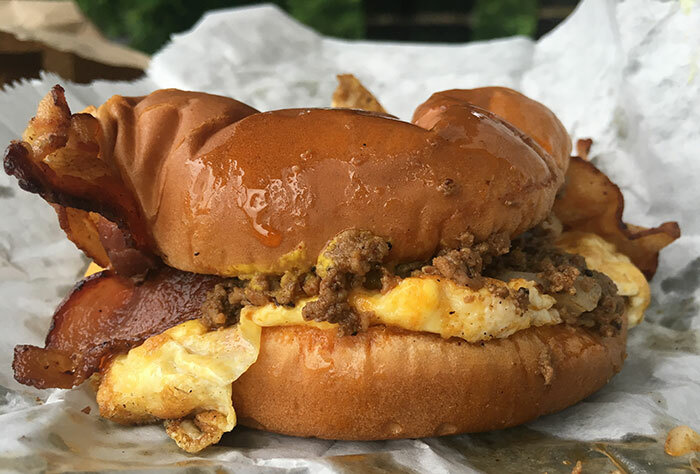 Vibe: Classic, popular Charlotte breakfast spot. Analysis: You’re not leaving Toast hungry; the BEC is huge. Eggs are scrambled, so they always run the risk of being slightly overcooked. The service at Toast is A+. I like how they push coffee refills and you leave all jittery because you just drank 4 cups of strong coffee out of their red mug. Vibe: Well designed, fast casual in South End. Analysis: Huge, Instagram-worthy biscuit. Also, check out their signature biscuits — the Chicken. Set. Go. ($9) and the Kickback Chicken ($9.50) are my favorite. Vibe: Eclectic French bakery and cafe. 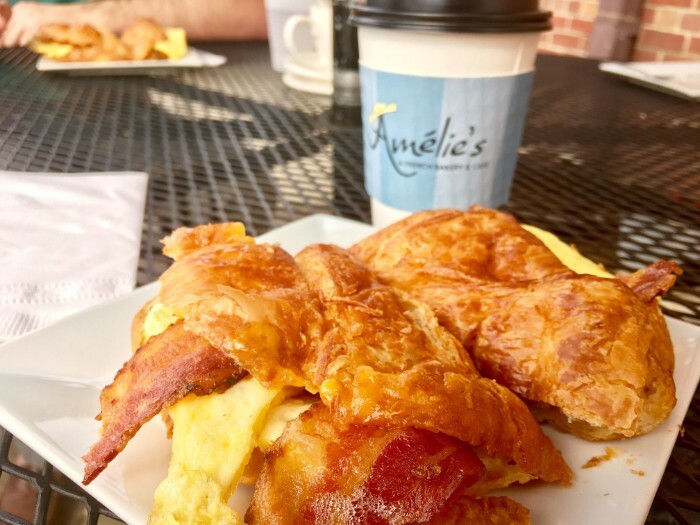 Analysis: When you think of Amelie’s you think of salted caramel brownies and coffee, which is why this BEC is our city’s most underrated. It’s an indulgent sandwich that’ll leave your hands greasy with satisfaction. While the BEC on a croissant is good, the BEC on a baguette is great. 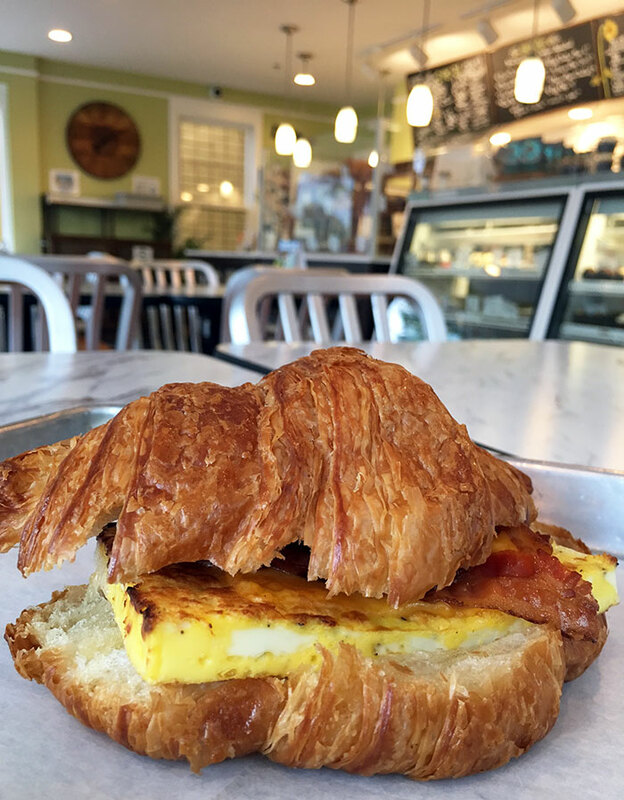 Vibe: Popular bakery with two locations in the heart of both Dilworth and Elizabeth. Analysis: Buttery croissant makes the sandwich. 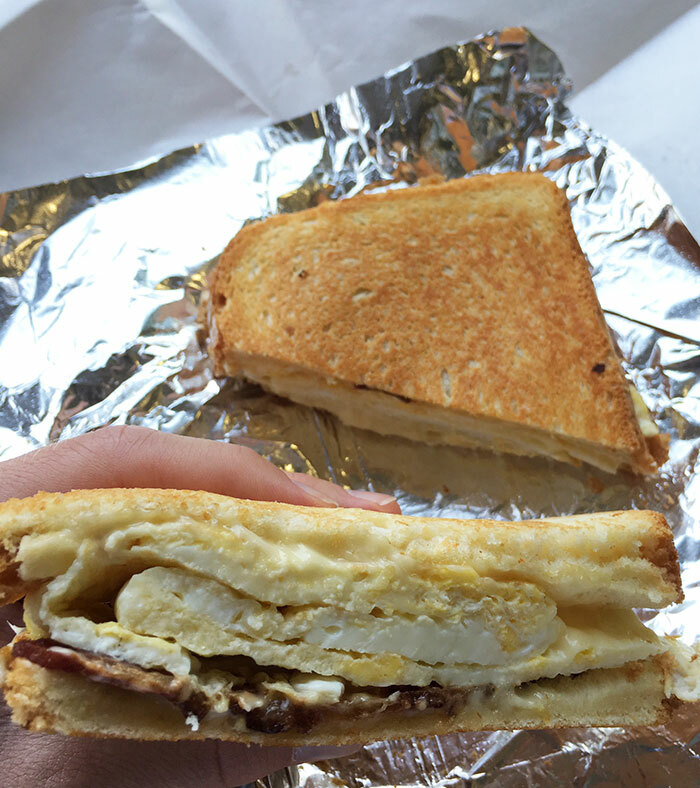 The sandwich is large and the egg comes square. It’s tasty, but Sunflour should up its bacon game. Another Sunflour must-try is their cinnamon roll. It’s outstanding. Vibe: Popular, old-school burger hut in NoDa. Analysis: Outstanding bacon flavor. Order it “All the way.” I’ll be honest, chili at 7 a.m. sounded kinda gross and I was skeptical of their decision to use a hamburger bun. 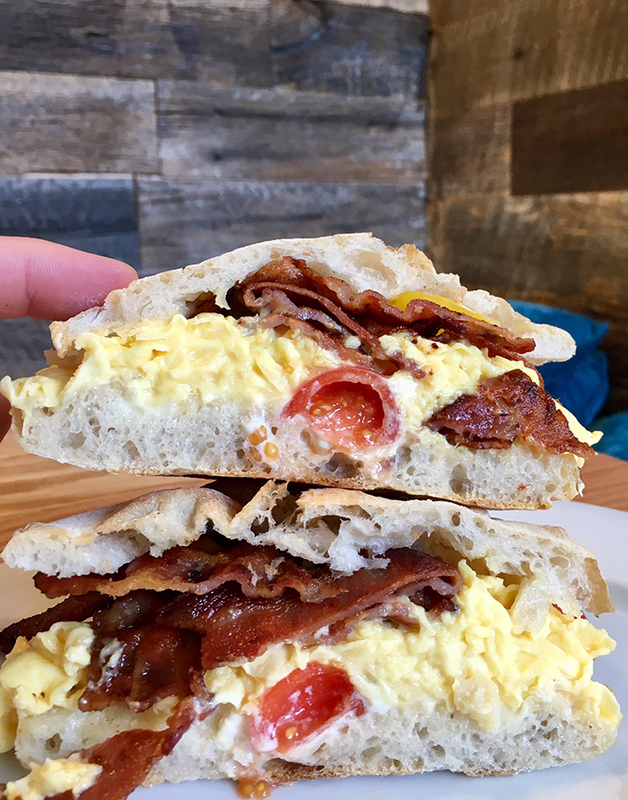 But the BEC delivered. Bun was fresh. The flavor of the bacon and chili really mixed well together although it did overpower the egg taste. 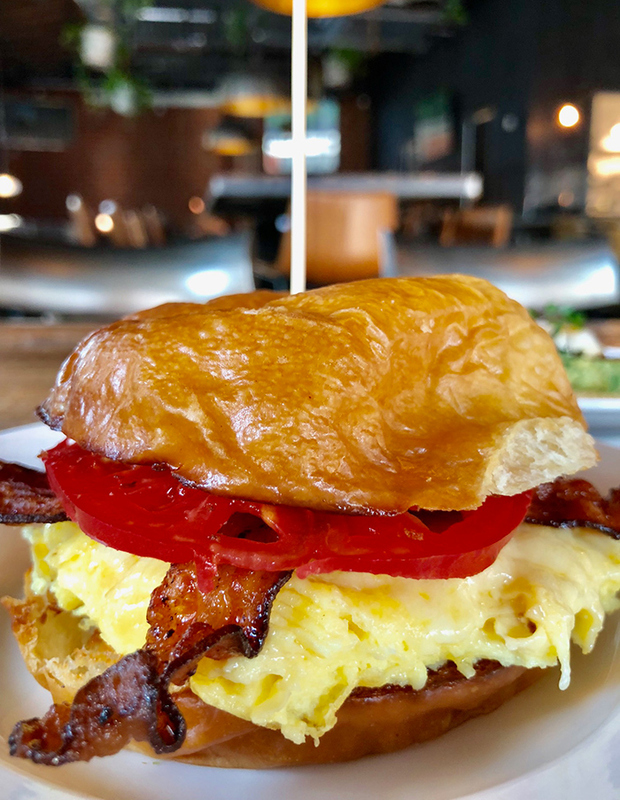 Your breakfast sandwich options at Brooks’ include: Sausage & Egg, Bacon & Egg, Bologna & Egg, Country Ham & Egg, Smoked Sausage & Egg, Liver Mush & Egg and Ham & Egg. Sandwiches cost between $3.25 and $4.00. Add $.25 for cheese. Vibe: Los Angeles trendy vibe in Myers Park close to Selwyn Pub. Analysis: By far the fanciest BEC on the list. 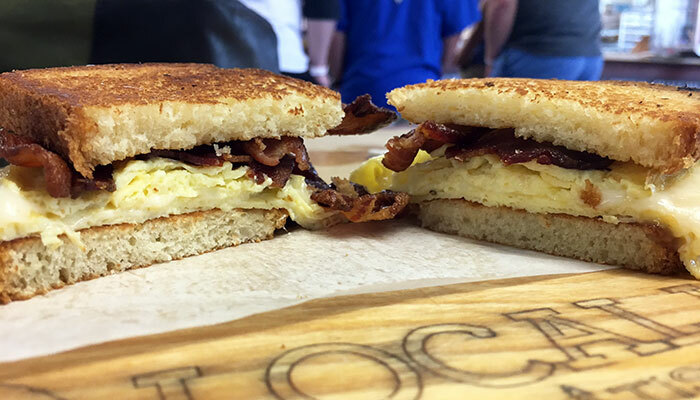 The grilled roll, runny egg and unbelievably thick bacon work well together. Seriously, the bacon is about a 1/4 inch thick. My favorite breakfast dish at littleSpoon is their Hash — it’s pricy, but outstanding. Oh, and be prepared for coffee mugs without handles. Vibe: Cozy neighborhood diner in Plaza Midwood. Analysis: I love it for it’s simplicity. Freshly cooked egg. You can get it on a biscuit, but toast is more popular. 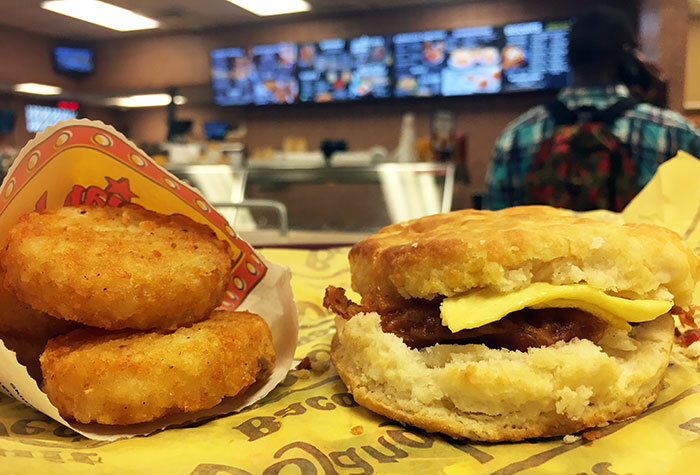 Order the hash browns if you’re looking for a side. Vibe: Chill. Beautiful urban grocery perfect for a coffee meeting or a bottle of wine with friends. 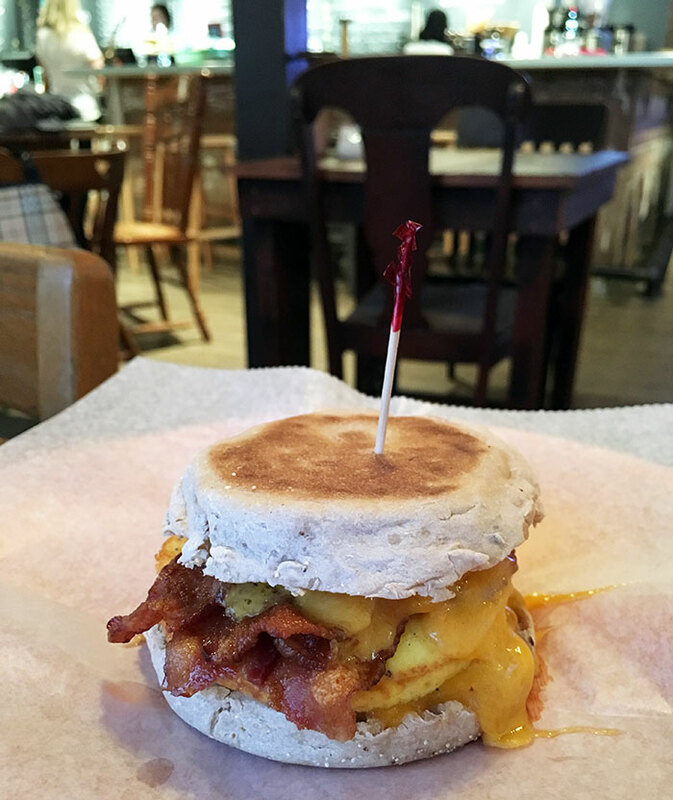 Analysis: It’s named “Mary’s Muffin” and it’s made up of Scrambled egg, cheese, tomato, mayonnaise, and bacon. It’ll run you $9. 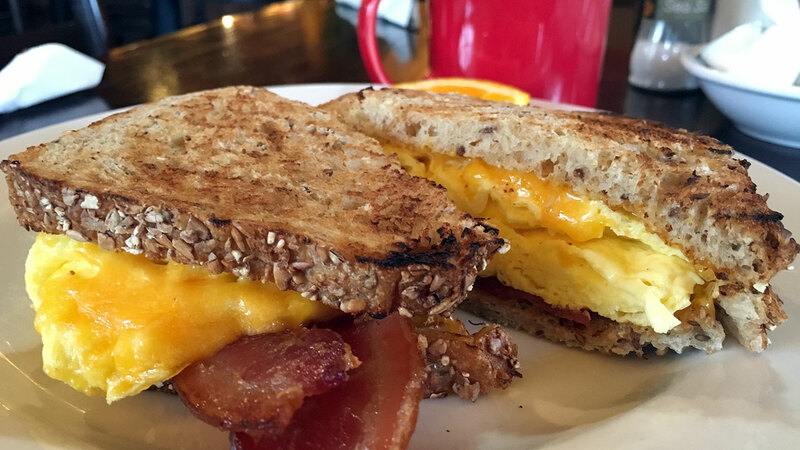 Sure, it’s expensive for a bacon, egg and cheese sandwich, but it’s tasty. It’s gorgeous inside Lincoln’s Haberdashery, so order a coffee and plan to hangout their for a while. 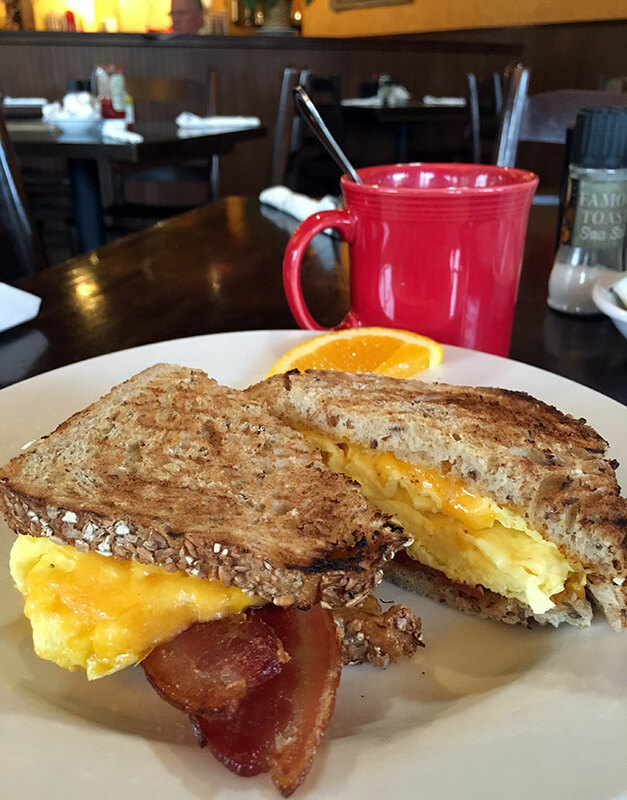 Analysis: The chewiness of Owen’s BEC makes it both delicious and memorable. I’m a huge fan of their steamed bagels. Vibe: Popular neighborhood market in FreeMoreWest. Analysis: It’s delicious, but messy and hard to manage. This is the type of sandwich you eat and then watch Netflix on the sofa, not eat and then work. Rhino’s deli lunch options are also outstanding — I’m a big fan of their Chicken Torta and Big Wheel sandwiches. Vibe: Charlotte-based restaurant known for their made-from-scratch buttermilk biscuits and iced tea. 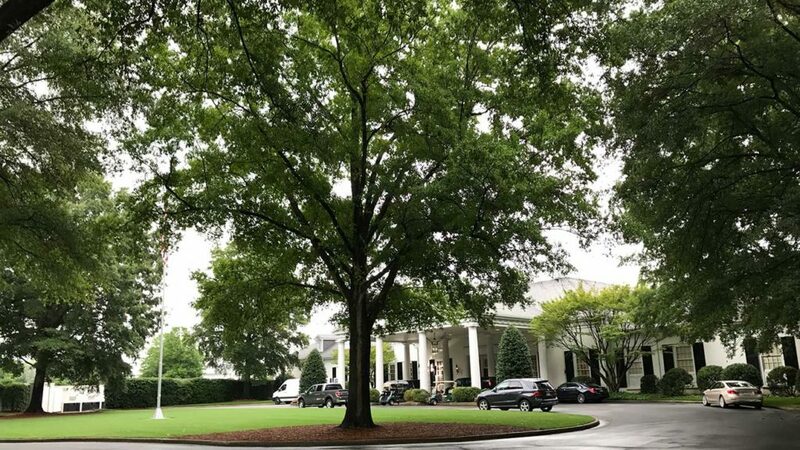 Analysis: The biscuit makes the sandwich. Because of the manageable size, it’s easily portable and you’ll have belly space to crush some Bo Rounds. Also, check out the fancy new Bojangles’ restaurant design in West End. Vibe: Restaurant, patisserie and bakery focused on local ingredients in Uptown’s 7th Street Public Market. Analysis: They were out of croissants when I visited, and the BEC just isn’t the same on brioche. 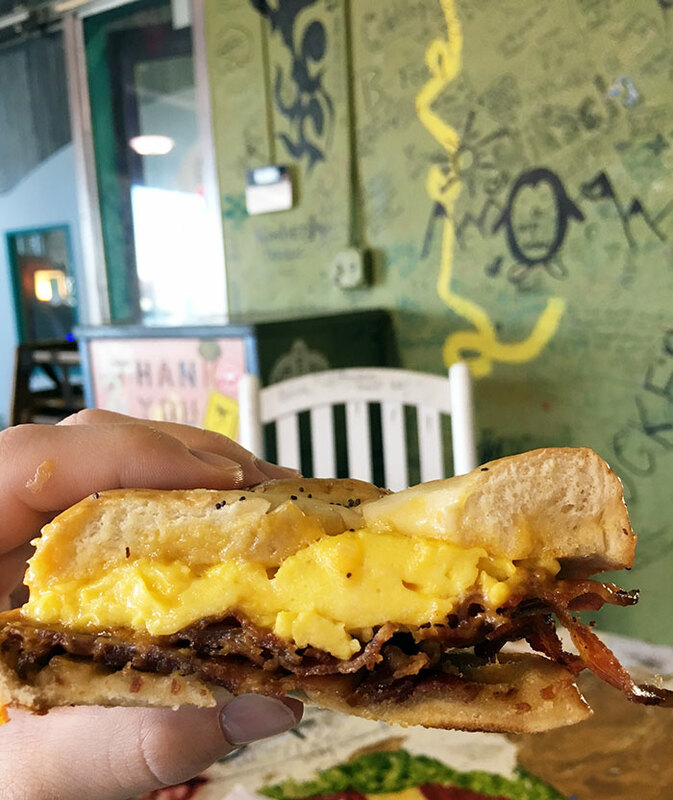 While the BEC was tasty, I couldn’t help from being extremely jealous of the guy next to me eating Local Loaf’s Chicken & the Egg breakfast sandwich. Vibe: Arguably the most beautiful restaurant in the city. Analysis: It’s a little butter, but delicious. The tomato scared me at first, but I liked it. Also, checkout their Avocado Toast with a fried egg on top. Vibe: Chicken salad spot with an upscale, cozy atmosphere. Analysis: Not too big, not too small — I love the size of Mayobird’s manageable BEC. 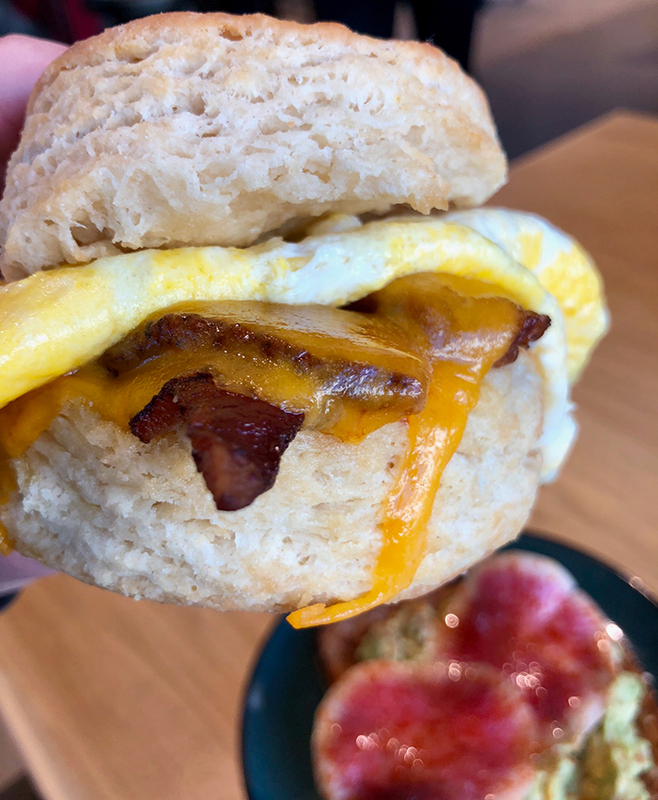 Well proportioned eggs, bacon and cheese which makes each bite delicious. I’m a huge fan of morning work meetings at Mayobird because it has a relatively peaceful atmosphere and the service is excellent. Their #1 breakfast best seller is “The Hippie” — yogurt and granola for $3.50.